Mali Mish - Day 94: Kentucky Horse Park in Lexington. Day 94: Kentucky Horse Park in Lexington. The Kentucky Horse Park has been good to us. It gave us just the right kind of stay we needed both times we have been here in the last two weeks. It is quiet, spacious, well-maintained and priced well below what you would expect for a place like this. We have stayed here 3 nights while using it as a staging location for our various explorations around here. 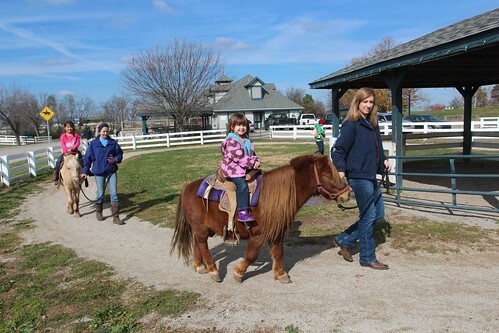 Today we are finally going to visit what most people come here to do, visiting the Kentucky Horse Park. The Troutstream packed up this morning as they will be headed back to Ohio after our visit to the park. 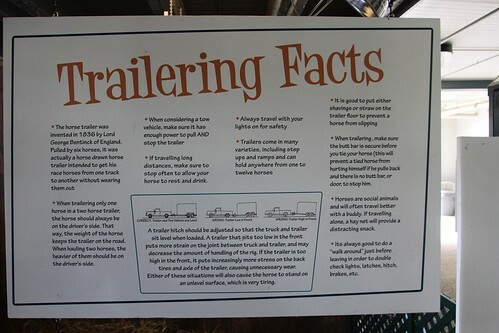 There is plenty of parking there so they can just leave the Airstream in the lot with all of the other horse trailers. Guess which two adults got into horsing around with the children? Doug and I are very much alike. We clearly have the same taste in travel trailers, we have the same sense of humor, like to eat, similar in age and can behave like goof balls to our wives dismay. Only if I was a lawyer and a marathon runner would we be more similar. I am not sure which one of the two is an easier goal. 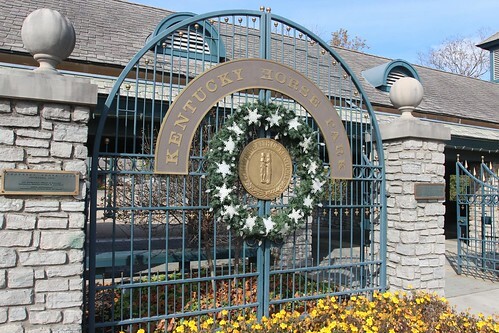 The Kentucky Horse Park started back in 1979 as a retirement home for former champion race horses. It has since been home to some of the most celebrated competition horses of all types. 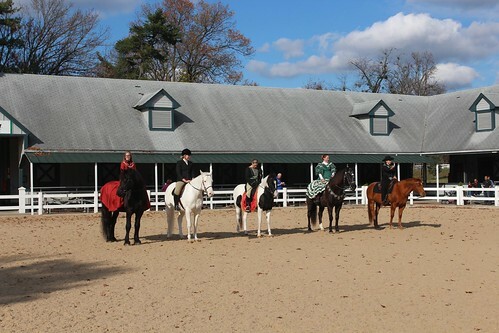 It regularly hosts classes of workouts for horse riding and it is also now the headquarters of the National Horse Center which houses several organizations that govern equestrian related events and competitions. 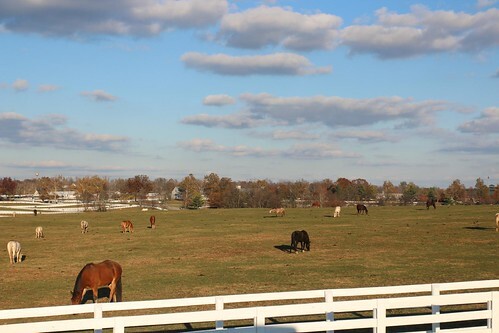 This time of the year, the Kentucky Horse Park is deserted. As a matter of fact, today is the last day of the season for some of the activities. 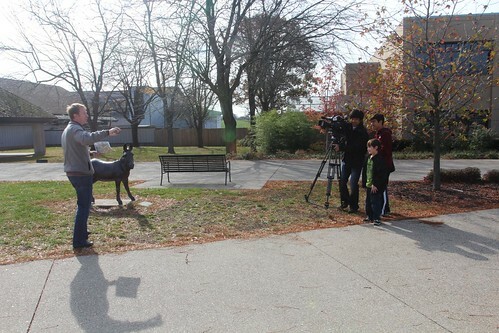 We met a couple of documentary filmmakers from South Korea while we were here as they were shooting a film about horses. 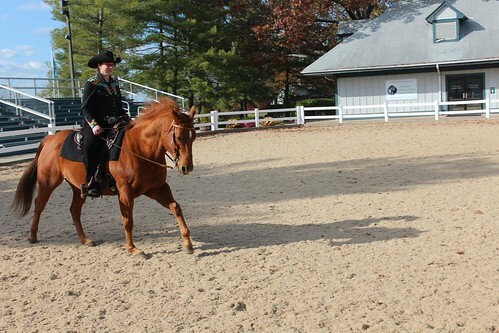 There is a burgeoning equestrian community currently underway in South Korea and they are here in an attempt to educate South Koreans about horse culture in America. Unfortunately for them, the most interested segment they shot today is Doug’s middle boy, Ethan, doing it Gangnam style. 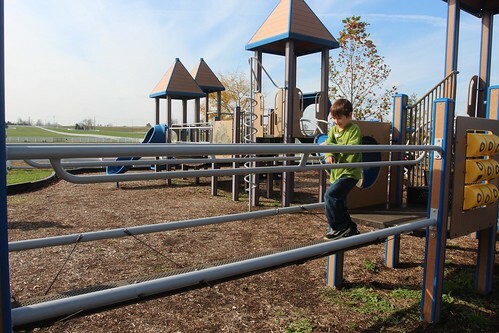 Here is Ethan doing in Gangnam style again in the playground. 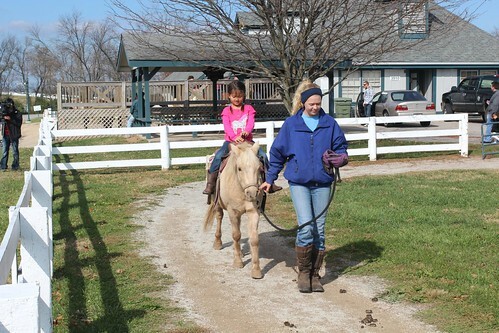 Ava isn’t quite as familiar with Gangnam style but she was exciting to ride on a little pony. 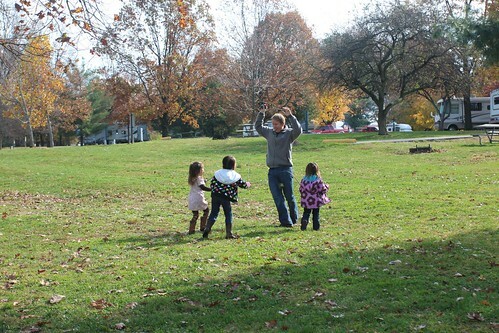 The admission to the park is $18 per adult and kids under 6 are free. If you are staying at the park, you get to buy adult tickets for $12. I am not saying you should do this, but one could theoretically buy tickets from the campground office even if one is not staying at the campground. Ahem… you didn’t hear it from me. The girls got to ride on ponies although it was not included in the admission price. But it is fairly reasonable at $5 per child. 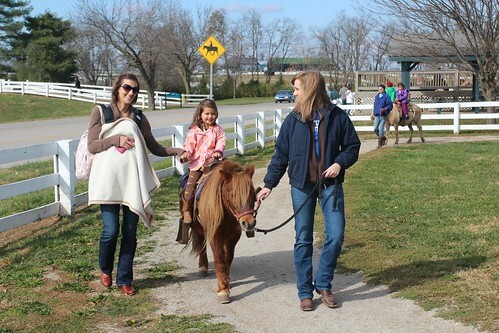 This is Mila’s second time on a pony and she insisted Marlene hold her hand the whole time. When Ava was 4 years old, she had a Jesse the Cowgirl party and we had pony rides at Marlene’s parents house. Mila was only one-year-old and cried the whole time. 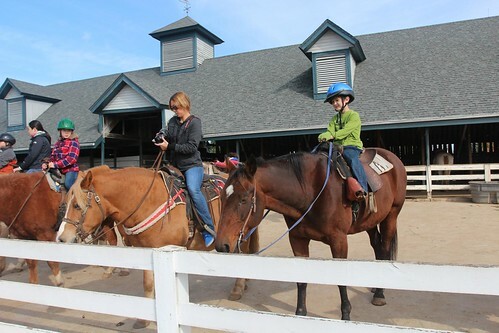 Jack and Ethan got to get on big boy horses all by themselves and went for a 45 minute ride around the compound. They were pretty stoked about it and I’d imagine there was a lot of gangnam style going on along the trail. I can’t help but to imagine how our pioneering counterparts from the 1800s traveled through these same roads in horse-drawn, covered wagons. They had no water or electrical hookups and bring a whole new perspective to boondocking. 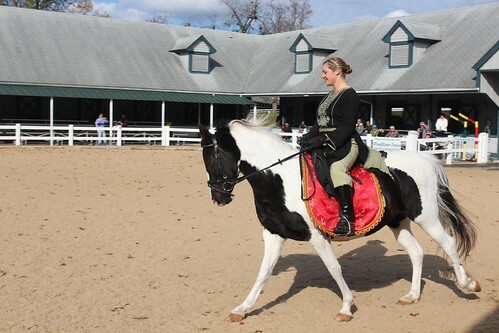 Twice a day during the season the park puts on a show displaying several breeds of horses from around the world. We were a couple minutes late getting to the show so we got to see only 4 of the 5 horses being introduced. This here is one of the most popular and celebrated horses in America. 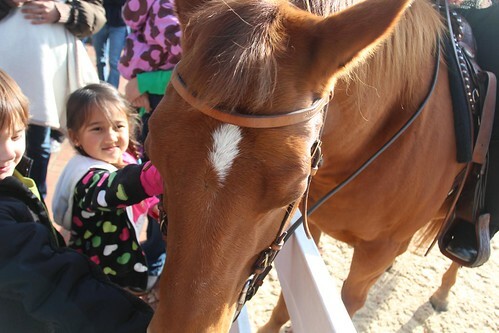 The American Quarter Horse, better known as the Cowboy’s Horse, is the horse that won the west. This beautiful breed that originated from Spain is called the Andalusian. It is know as the Horse of Kings and has been bred since the 15th century. 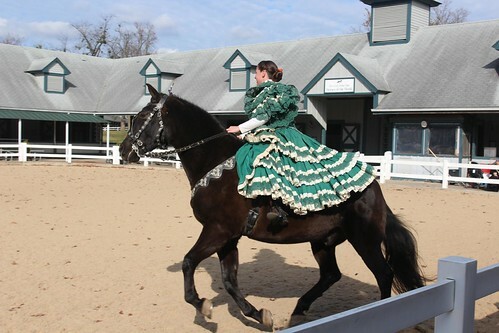 Known for their long, flowing manes and athleticism, Andalusian horses are often uses in dressage competitions. One of the rarest of horse breeds in the world is this beautiful Marwari from India. Their most distinguishing physical characteristics are the inward curves at the tips of their ears. 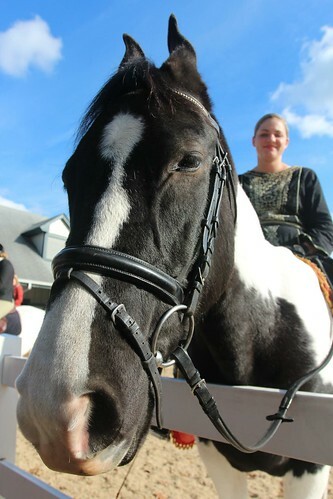 Only 500 are known to exist in the entire world and there are 2 of them here at the Kentucky Horse Park. 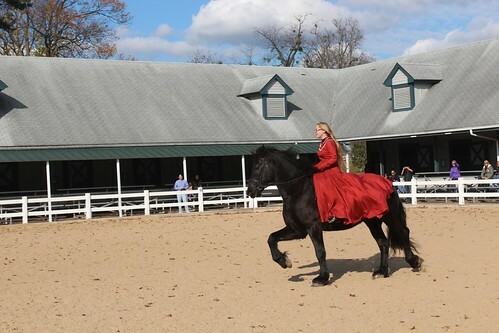 This powerful, yet elegant Friesian horse is from the Netherlands and is know for its history in the middle ages as a desirable breed for a war horse. It resembles a draft horse in physique and can only be of pure black in color. It is nimble for a horse of this size and type and is strong enough to carry a knight in full armor into the battlefield. Friesian horses nearly became extinct on several occasions but due to conservation efforts, it is now a thriving breed worldwide. At the end of the demonstration, all horses came out together and we got to see the first horse we missed which was a thoroughbred. It’s the white horse second from the left and is known for having the best physical traits for a race horse. 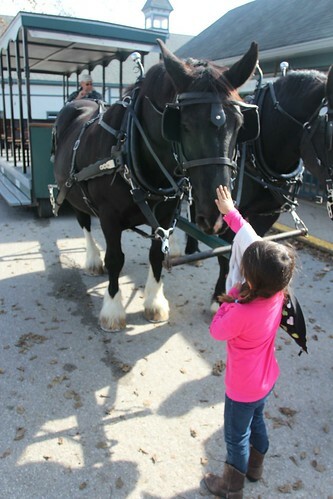 All of the show horses had just gotten a bath earlier in the day and were very soft to the touch. They are all extremely gentle and love the attention they get from tourists. When the demonstrations were over, they all came to the edge of the field to let people take photos and pet them. This quarter horse was one of nicest and gentlest horses we have ever seen. Feast your eyes on this beauty. One of only 500 in the entire world. In this photo you can really see the twist near the tops of its ears. And finally, another mini rally with the Troutstream has come to an end. We will be starting to head further south and east from them and will not likely see them for awhile. The girls had a great time playing with each over this last month which is much longer than any other family we got to hangout with on this trip. We might see them again in Florida sometime in 2013, but for now, we are headed our separate ways. After Troutstream headed back home, we spent another hour or so at the park checking out the museum with our friend Carrie who also came from Louisville to meet us at the Horse Park. 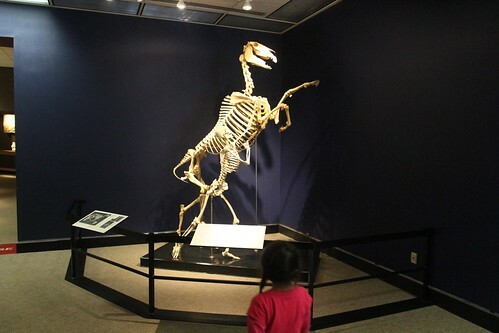 There are a couple of museums on the park grounds and the International Museum of Horses is the bigger and more popular one. It features anything and everything that has to do with horses. 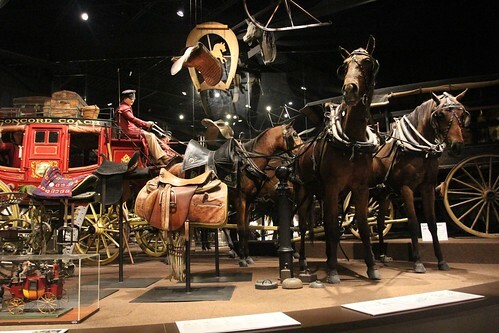 From the historical significance of each breed, all the way to Hollywood films and televisions shows that feature horses and the equestrian lifestyle. 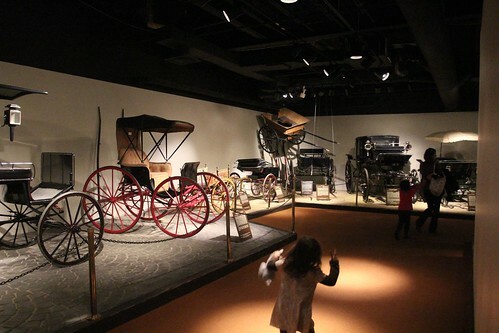 We particularly like the buggy and carriage collection they had near the end of the museum. 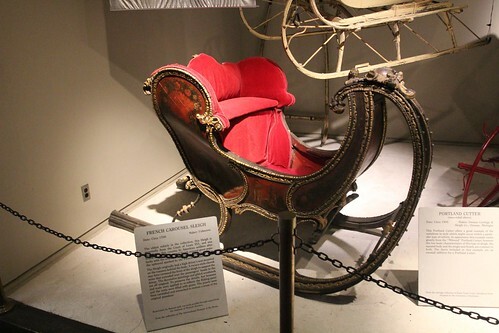 Our favorite is this sleigh that looks to have been owned by Santa Claus once upon a time. Whether you are into horses or not, Lexington is a beautiful part of the country with a very distinct and sophisticated lifestyle. We enjoyed our stay here and especially since we got to share with it our new friends as well as old. 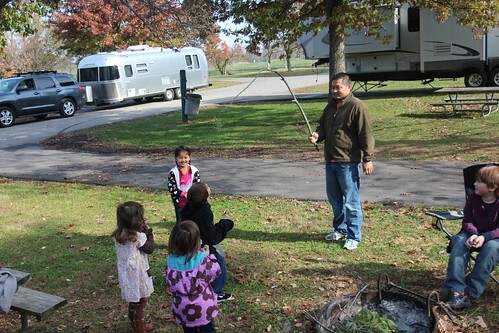 We will spend another night at the campground here and continue our journey southward tomorrow. Day 93: Kentucky Bourbon Trail. Day 95: Driving to Bardstown, Kentucky. 4 Responses to Day 94: Kentucky Horse Park in Lexington. I enjoyed the post Dan. I have never seen so many candid shots of myself. That was a great weekend in Kentucky. I would not recommend becoming a lawyer or a marathon runner. Many of those who fall into either category suffer from excessive personalities. It is enough that we both have a good sense of humor and get along. As for our wives, they secretly enjoy our playful sides. The have to feign disapproval for the kids sake. I am hoping to retire from law and marathon running if Ethan can win Korean Idol. I’m gonna get that kid some dance lessons and become a stage father. I should ship the Troutstream over to the Gangnam neighborhood to coach him fulltime. We will see you guys soon. The longer you stay in Florida, the better the chances are that we will come down to Sanibel Island. Safe travels. Loved the photos and so happy you made it to the Park! I found it totally fascinating, but that could be because I don’t know one darn thing about horses. Keep those updates coming! Glad to find your blog via tiny house, and glad that you enjoyed your stays here in central Kentucky. Happy trails to you and your family. God Bless!